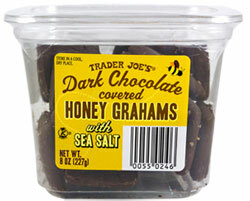 In August 2015, Trader Joe’s issued a recall of their Dark Chocolate Covered Honey Grahams with Sea Salt due to the fact that the product may contain milk, which is not listed in the ingredients. If you are not allergic to milk, then you’re free to continue crunching away in peace! If you are, you can return the product for a full refund to your local TJ’s. As a precaution, the product is being removed from all TJ’s stores, so it will no longer be available going forward.